A fine-sounding and flexible synth in a small, but highly useable package. Many connectivity options. 100% analogue signal path. Flexible sequencer section. A year ago this writer looked at Arturia's first foray into 'real' analogue synthesis and was so taken by it that he went out and bought one. The MiniBrute isn't a perfect synth, but it has some great features, an individual sound, and a real charm - most of all, it's fun. Given this backdrop, you can imagine our glee when we were asked to take the new (and very secret) MicroBrute for a spin. As soon as the box arrived, the family resemblance was clear to see, but in a significantly smaller package. The MicroBrute has a two octave mini-size keyboard and a footprint that is about half the size of the MiniBrute. "All controls remain 'adult size' so parameter access is still quite straightforward"
However, all controls remain 'adult size' so parameter access is still quite straightforward, and there are no hidden menus or functions. The synth features both USB and MIDI In ports, with USB carrying MIDI data both ways and providing access to the 'MicroBrute Connection' software on a connected Mac or Windows computer. Like its big sister, MicroBrute is of the single oscillator, multi-waveform design. This forgoes independent, multiple detuned oscillators for the ability to mix similarly pitched sawtooth, square and triangle waveforms simultaneously - rather like the classic Roland SH-101. Although this is less powerful on paper, Arturia's Brute-series synths include some interesting wave tweaking tricks that make the waveform section more flexible than it might first appear. Perhaps the most obvious of these is the ability to vary the pulse-width of the square wave. However, if fatness is what you require, the sawtooth wave includes the Ultrasaw option which adds multiple phase-shifted saw waves to the original. The triangle wave has a Metalizer knob, which does exactly what it says, by adding a harsher edge to the otherwise mellow harmonic make-up of this waveform. Where the Micro differs from the Mini is in the number of controls related to each of these elements. The bigger synth has its own dedicated Ultrasaw modulation LFO, with separate control over rate. The Micro requires you to patch its single global LFO into service to achieve this. Similarly, on the Mini the Pulse Width and Metalizer amount have independent envelope modulation parameters as well as their own depth controls in the LFO section. However, the Micro does add the very neat Mod Matrix panel, which allows you to patch the envelope and LFO depth to different locations using the 3.5mm mini-jacks. "The Mini- and MicroBrute can be combined into a very powerful system without even touching anything so modern as MIDI or USB"
This is where things get interesting, as the MicroBrute includes a wider range of CV/Gate interfacing options than the Mini. Both synths can be linked together very easily and with a wide range of analogue technology, from synths to drum machines. In fact the two can be combined into a very powerful system without even touching anything so modern as MIDI or USB. One sad omission on the oscillator front is that of 'Noise', though an external audio input is still provided via the back panel, as is a sub-oscillator. The sub doesn't offer a choice of waveshapes or octave-switching, but it does allow you to tailor the harmonic mixture, from a fundamental an octave lower to a fifth above. It should also be noted that the Micro has only one envelope generator, which must be shared between modulation duties. The filter section on both Brutes is largely the same, and built around the unconventional multi-mode Steiner-Parker filter. At only 12dB/octave in Low Pass mode, it may seem underwhelming on paper, but let's not forget that there are many great synths which don't possess the supposed 24dB/octave benchmark for 'fatness'. In fact, as we noted with the MiniBrute, this filter has its own character and once again allows the MicroBrute to carve-out its own sonic space. The Micro drops the Notch filter option, though this is perhaps the least-used of the various modes. The MicroBrute includes what on paper appears to be a rather basic sequencer section, though once you get stuck in it really is quite flexible. There are eight different pattern slots available, and each can store a sequence of up to 64 steps. The Rate control determines playback speed, and if any external MIDI clock is detected this switches to a clock divider. Sequences can be recorded quite easily via the keyboard, with the Tempo button doubling as a way of adding rest notes to the pattern. By switching back to Play mode, patterns are played when pressing a note, and transposed as you move up and down the keyboard. Whilst the MiniBrute had a useful arpeggiator that could be pressed into service as a very basic sequencer of sorts, the MicroBrute offering is altogether more useful in my book. The Connection software adds many options for how and when new patterns are triggered, making this much more than just a little bit of fun. I successfully linked my Korg Volca boxes to the MicroBrute in many different ways, allowing the Korgs to trigger the Arturia and vice-versa. Unlike the MiniBrute there is no swing control included on the Micro, though you can programme triplet-based patterns with a little effort. Although I didn't get to try it, Arturia have told me that the final released version of the software will even enable you to import and export patterns to and from your computer. I have to admit to falling for the MicroBrute almost immediately. It is compact, powerful, flexible and very fun. There is also nothing in the analogue synth landscape that offers the same kind of features at this price point currently. Of course, for the same money you could buy a polyphonic virtual-analogue such as the MicroKORG or MiniNova. Despite these being fine-sounding pieces of kit, they don't offer the true analogue experience in terms of sound or control. However, in fairness this also comes down to a question of bank balance and taste. The MicroBrute isn't going to replace a well-specified software synth design in terms of flexibility and sonic scope, but it is very good at being an analogue monosynth. "Although it is 'mini' it feels very much like a grown-up synthesizer"
Some might argue that an option to run on batteries would have been welcome, though Arturia claim that sacrifices in sound quality would have been required. Although it is 'mini' it feels very much like a grown-up synthesizer, and one that offers enough interesting connectivity options to continue earning its keep as part of a larger or expanding system. The wide range of analogue patching makes for some serendipitous sound creation opportunities when combined with other, even modestly priced, pieces of kit, and this is what many analogue proponents are after when eschewing the world of MIDI. 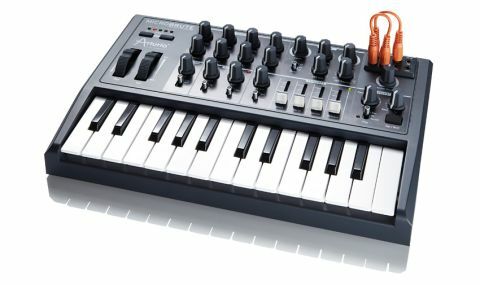 We had expected compromises to be made when Arturia trimmed the MiniBrute down in size and price, but in truth there are some elements in the Micro that are more flexible or better implemented than before, which makes this writer want to own both - a clever move on Arturia's behalf perhaps. It does beg the question of what will come next - MacroBrute, PolyBrute or NanoBrute? I'll think I'll join the queue now!